One of the best things about Big Sky is that it has terrain for every ability level. Many people don't realize this because of Big Sky's big mountain reputation. A lot of Big Sky's hype is focused on Lone Peak, the Big Couloir, the North Summit Snowfield, and the Challenger zone. But behind all the advanced and expert level skiing, there is enough beginner terrain to keep even the most beginner skiers and riders entertained. Based on some simple math (15% x 5800 acres), that's 870 acres of beginner terrain! That's more skiable acreage than some entire ski resorts. With almost zero crowds and over 400+ inches of fluffy snow every year, Big Sky is one of the world's best places to learn to ski. Lone Wolf - Lone Wolf is the signature green run underneath the Explorer Chairlift. It features a mellow pitch and very little traffic. It's a great place to hone your skills before you step up to the bigger chairlifts. Mr. K - Mr. K is Big Sky's classic green run. Take Swift Current chair up and Mr. K drops from below the Lone Peak Triple back to the Mountain Village. It's named Mr. K in honor of Everett Kircher, the founder of Boyne USA. Cinnabar - Cinnabar cruises from the top of Six Shooter chair all the way to the Madison Base area. It seems to go on forever as it weaves around large tree islands, crosses over bridges, and meanders past vacation homes. Deep South - Deep South is a long and mellow run that skirts the far side of the Southern Comfort terrain. At the border of Big Sky Resort and the Yellowstone Club, there are a handful of large homes that overlook this green run that is hardly every crowded. Sacajawea - Sacajawea is sandwiched between two blue tree runs called Pomp and Lizette near the Southern Comfort chair. Named after the Shoshone interpreter and guide who accompanied Lewis and Clark, Sacajawea is a south-facing green run that goes from the top of Southern Comfort to the bottom. It's a beautiful place to spend the morning. There are lots of other green runs that beginner skiers and riders will enjoy. Safari, Lower Morningstar, and Cupajo immediately come to mind. You can find even more on the Big Sky Resort Trail Map. 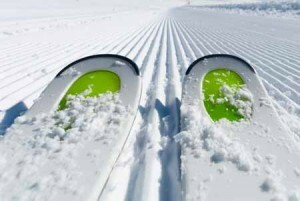 Grab your skis and explore the best ski runs for beginners at Big Sky Resort. You can also book a ski lesson with a Big Sky Mountain Sports instructor to learn some tips and tricks to take you to the next level.